Shorts Lifts have evolved to become a leading supplier of complete lifts, lift components and spare parts to the UK lift trade. 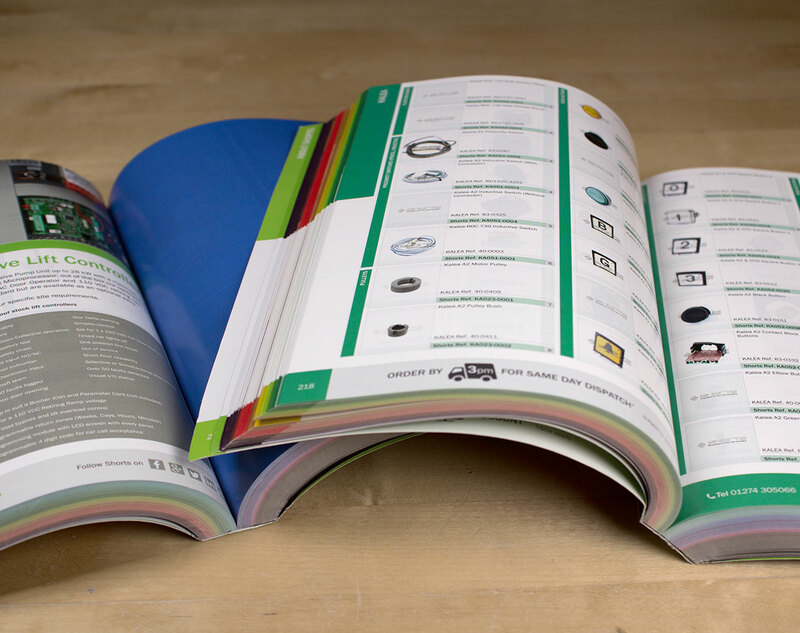 They approached CODA to design and produce a 650 page Large Product Brochure containing over 8000 lift parts from more than 30 manufacturers. It needed to be designed in a way that would allow engineers to quickly identify and find the part they needed for a job. 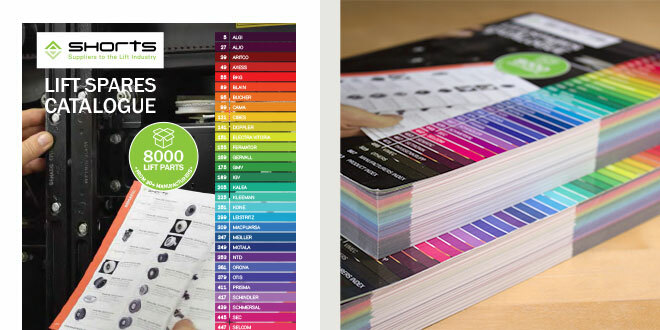 The design layout for this Large Product Brochure had to be carefully considered due to the massive amount of information we would have to display. All the products needed a small section that would have enough space for a product image, 2 reference numbers, a small description, an item number and also a few attributes of that part. 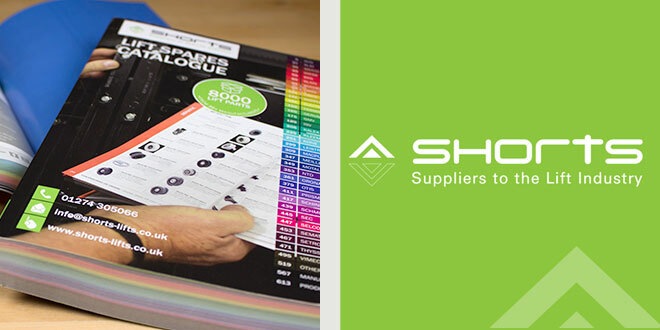 We created a tight gridded layout for each page that would display 16 items and used a coloured coded system to separate each item into manufacturers. 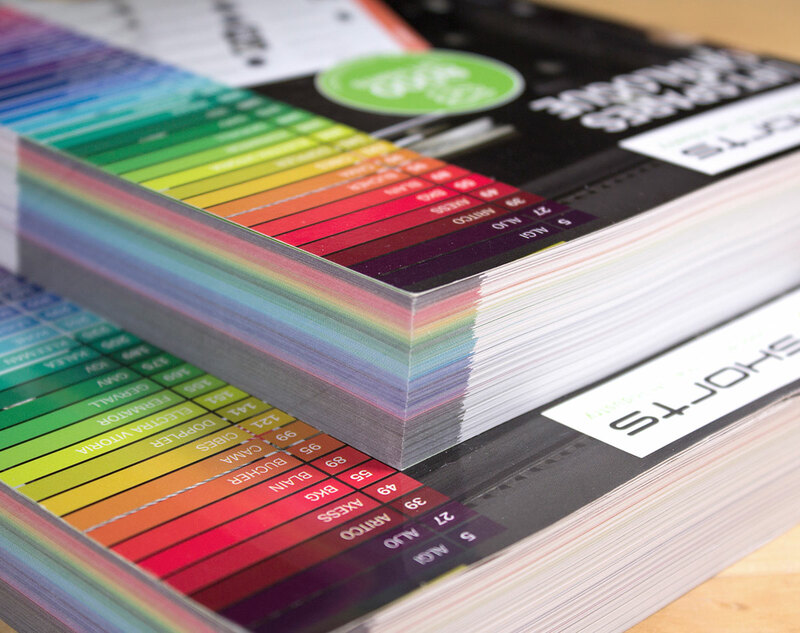 We used these colours on the cover of the brochure to allow clear and easy navigation to the part. 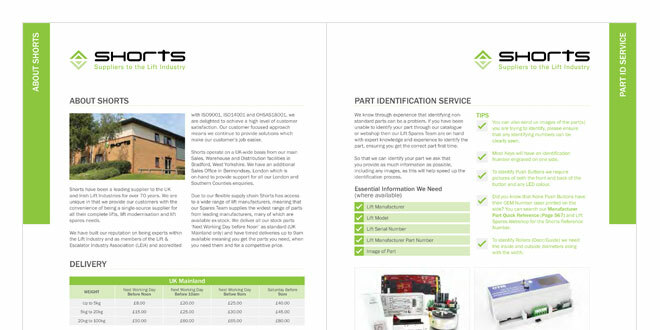 To help sub-categorise the products even further, we used bright coloured blocks on the spreads to allow us to inject a bit more of a design style in to the brochure again to help navigation. We also introduced 2 reference sections and an index which would make finding the required part much easier due to a cross referenced numbering system. 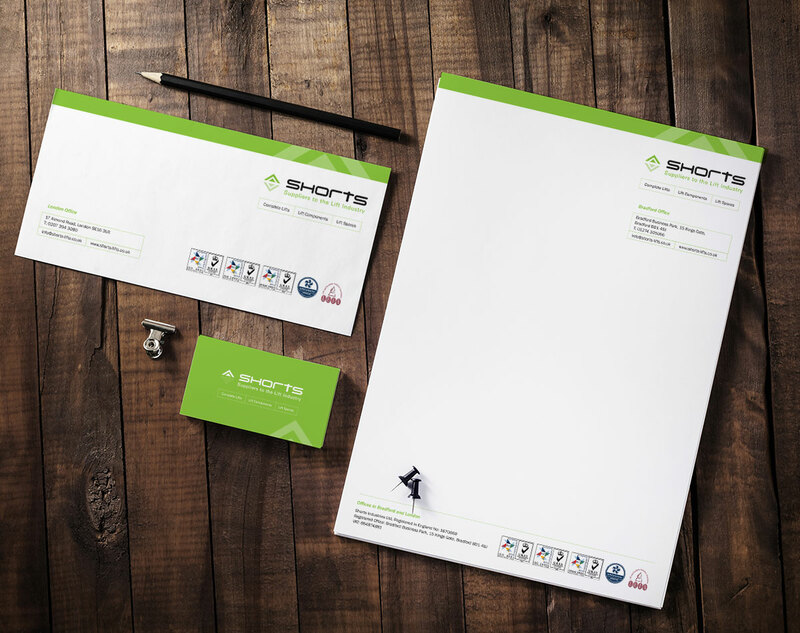 The brand was well established from the beginning so this particular project didn’t require much brand development but the challenge was to create something that could display large amounts of information in an appealing, clear and tidy format. 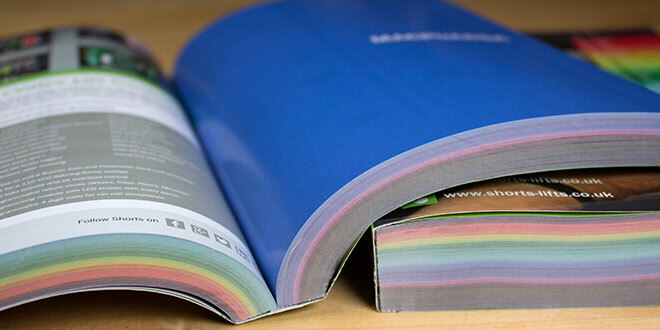 It’s certainly one the largest print jobs we have ever produced and overall the final product does exactly what was needed. 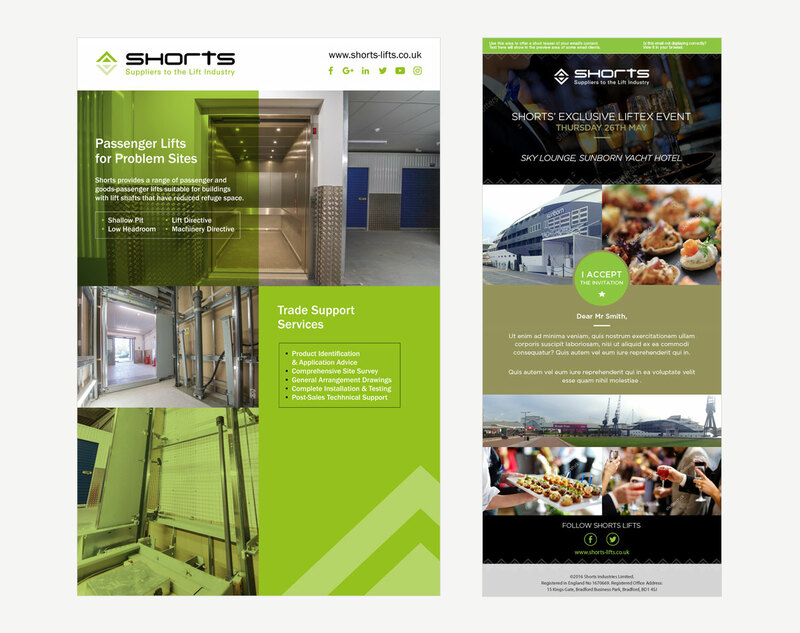 We have since gone on to help Shorts with their company/corporate brochure, marketing for various events and some HTML emails to support their marketing/sales initiatives.